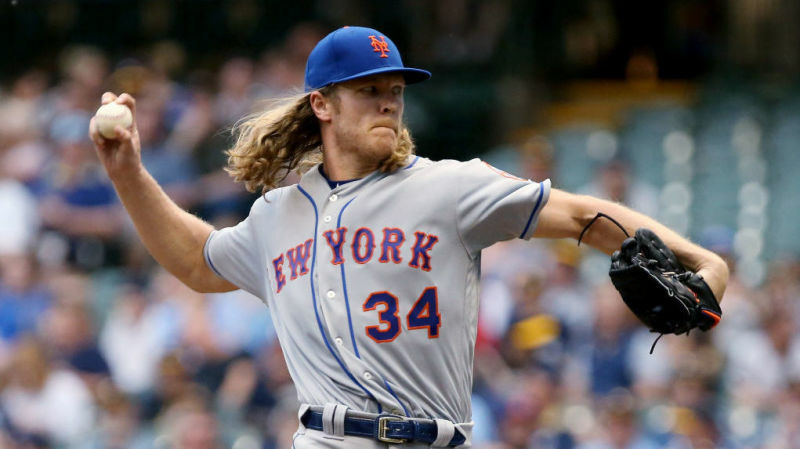 There are rumors swirling that the San Diego Padres are indeed talking to the New York Mets about right-handed pitcher Noah Syndergaard. Let’s examine some positives and negatives to a potential deal for the Padres, as they search for an ace to lead their staff. The San Diego Padres are shopping for a young ace. After years of treading water, the franchise finally appears ready to be a consistent competitor in the NL West. They have a young nucleus of hitters at the major league level and in the upper minors, but the team lacks a true top-of-the-order-type starting pitcher. There have been rumors that the San Diego Padres have been in discussions with the New York Mets in regard to pitchers. Jacob deGrom has been mentioned, but fresh off an NL Cy Young Award, the Mets might be very hesitant to deal him. Noah Syndergaard has been mentioned as a trade target for the Padres by Ken Rosenthal of The Athletic. He reports that the Padres are still very much interested in acquiring the talented right-handed pitcher. No word on who the Mes are targeting, or if the two sides have even started negotiating. If the Padres were to acquire the 26-year-old right-handed pitcher they would surely pay a hefty price. Let’s explore the idea further and examine the positives and negatives to a deal that could put the Padres over the edge – hypothetically speaking. Syndergaard is that good. There is no doubt that the Padres need an innings eater who ends losing streaks for ballclubs any time he takes the mound. 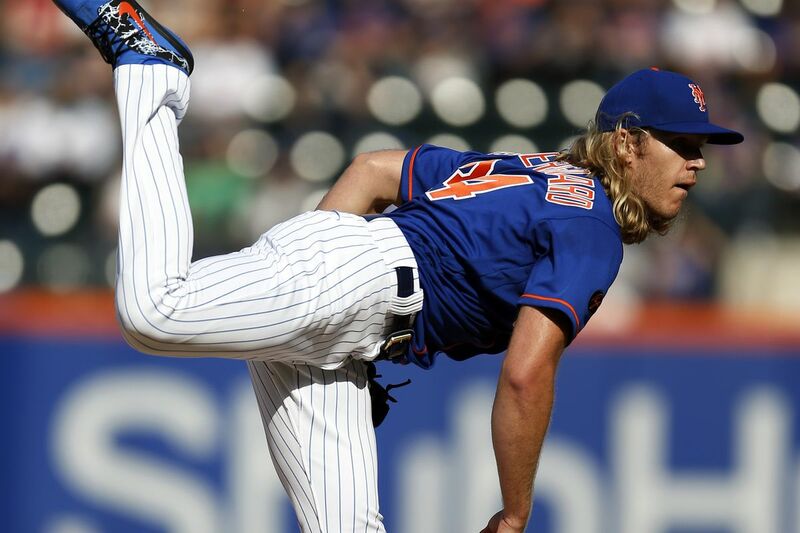 Noah Syndergaard features a high 90’s fastball and a slider he throws as high as 92-95 mph. He is filthy on the mound and there is no hitter in the game of baseball who enjoys batting against him. In this day and age where there are only a few pitchers who you can regard as an ace, Syndergaard is surely one of them. The Mets are blessed with two pitchers who can be given this label, so a deal could be consummated if the Padres pay the asking price. That is a big if though. 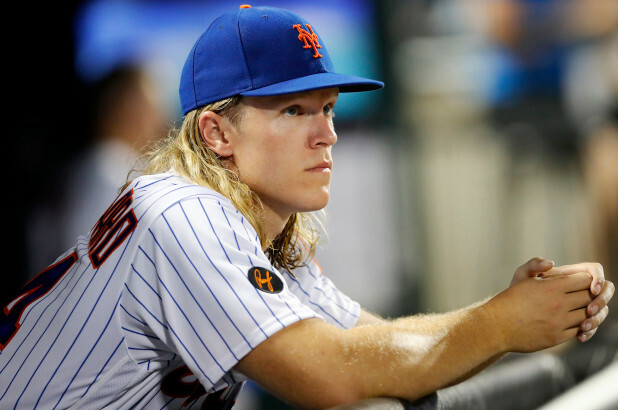 Syndergaard is not due for free agency until after the 2022 season. That is three years of team control over a pitcher who will be in the prime of his career. The Padres are surely looking for established major league pitchers who fit that mold. You cannot find a better pitcher for the Padres to build their staff around. At 26, he is only a few years older than Joey Lucchesi and Eric Lauer. He will relate to those young pitchers while giving an example of how to prepare yourself at the major league level. His combination of youth and three years of team control is extremely enticing for a club looking to break out. It is scary to think that he has yet to reach his ability as a pitcher. With a career record of 37-22 in 518 innings pitched, we have only begun to see what Noah Syndergaard can do in the game of baseball. He has struck out 573 batters in that time, which is impressive. As he grows and matures in the game of baseball, he should get better. Last year, Syndergaard won 13 games in 25 starts for the Mets. He has never eclipsed 30 starts and 183 innings in a season. Both those numbers were achieved in 2016, which was Syndergaard’s only all-star season. If he can again pitch close to 200 innings, the numbers will be there for this right-handed hurler. This is the elephant in the room. The Padres surely have the prospects to get a deal done, but are they willing to part with them and will the Mets settle for a package that doesn’t consist of three of the Padres’ top 7-10 prospects? Francisco Mejia is the name that keeps coming up in rumors as the Mets need catching help. The Padres acquired the young backstop with the intention of playing him, so this seems like a tough call for the Friars. Perhaps the Mets would take Austin Hedges, but he would have to be packaged with names like MacKenzie Gore, Adrian Morejon, Chris Paddack, and Michel Baez to even begin negotiations. The Padres would have to pay a huge price tag to obtain Syndergaard. Fernando Tatis Jr. should not be in this trade talk, but beyond him, almost anyone else could be moved to acquire Thor. If you think Myers and a package of lesser-tiered prospects will get a deal done, then you have no clue. The price tag would be painful for Padres fans. There is no doubt about that. We have already mentioned the fact Syndergaard hasn’t completed a full complete year of a major league season. That means that there are very few miles on his arm. This might be true, but there have been numerous small injuries that are a bit concerning if you are a team looking to acquire him. Last year, the big right-handed pitcher missed time with a finger ligament issue on his throwing hand, and he also missed a start with Coxsackie Virus (hand, foot, and mouth disease). In 2017, a lat injury sidelined him for most the year as he only made seven starts and threw just 30 innings at the major league level. There is a risk with Syndergaard, but the reward is ridiculously high. At 26, there is still time for him to reach his peak. The Padres are very close to being a franchise of relevancy. 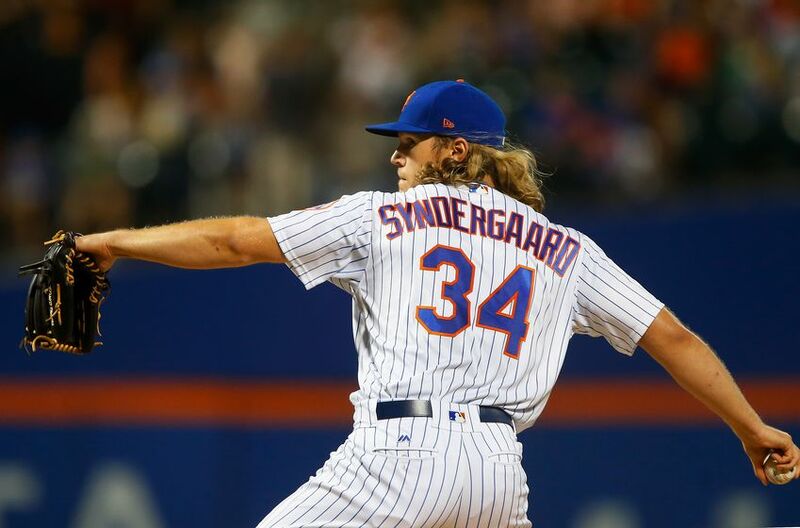 They need starting pitching, and an ace like Syndergaard would go a long way toward providing the credibility that the Padres so desperately need. He has risks, and the price tag would be ridiculously high, but it may be the right call for the team. A.J. Preller and Padres management will do their homework on Syndergaard. They will want to see all his medical records and talk to players and coaches who know him personally. The team needs an assertive young pitcher who wants to take on the challenge of leading a young staff. Syndergaard could be that man, but the fit must be correct for the Padres as the asking price will be high. This situation is fluid. The Padres have the ability to offer the Mets the best package of young arms. Realistically, the Padres could deal three starting pitchers and still have a deep farm system. MacKenzie Gore would be tough to move for Syndergaard, but if the Padres are really serious, he could be the headliner in a potential deal. As the winter season progresses, there will surely be more news on these two teams. The Mets are reporting that they do not want to deal Noah Syndergaard, but they could just be posturing in an effort to drive up the price. A.J. Preller and the Padres will likely have the final say if the Mets make a deal. The Padres have the talent the Metropolitans desire. I would definitely be okay trading Mejia for a young “ace”. Defensively, Hedges is a superior catcher and he is getting better and better every year at the plate. If you forget his horrible start in April, he was not bad. While Mejia has a quick bat, he lacks plate discipline. Way too many swings at bad pitches outside the strike zone. His bat speed reminds me a lot of a young Gary Sheffield. But he has got to learn not to swing at bad pitches. A lot depends on if Padres think he can get that under control or not. Maybe he can learn to play 3rd. Craig Biggio did it for the Astros. The Mets might be the only team that Preller can be trusted not to get hosed by. Every other time he’s traded for, or signed. established talent has been cringe-worthy. I think the article is spot on when laying out how the price will be painful. Don’t look for the Mets to do us any favors. 3 of the top 10 prospects seems a likely starting point. A harder decision to come to is should SD be interested? Young, yes. Great, yes. Good medicals, um. Pitchers get injured, and he’s been injured a lot already. Nothing comes with a guarantee, but it’d be a bitter pill to pay top dollar and have him get injured and miss a year or two. Let’s move on…Mets not trading Thor…Padres at this point need to concentrate on attainable assets not giving up the farm! Agree another year to access these prospects and then let MLB teams come to them with offers. Espinosa, Lamet, Rea w/another year of healing added to Lucchesi, Lauer, Strahm plus Paddock, Morejon, Baez, Allen, Quantril, Patino, Muñoz….plus the addition of perhaps a Sonny Gray/ groundball Kuechel this year and a major ace FA in 2020! We still havent a 2019 mainstay in the outfield , catcher,SS, 3B …think about that…hopefully we figure that out in 2019! Louis I can agree with the notion of obtaining our young ace through FA instead of selling the farm. There are many arms we can choose from and a two or three year to Nathan Eovaldi would bridge the gap to our “future ace” in our system. Lastly this will allow you to feel out your season and allow you chips to still get any other piece at the deadline. Go daddy’s!! In my opinion, its still one year too early and you get another year to evaluate the arms currently here. Allen, Paddack and Quantrill will get their chance. Lauer and Lucchesi get to see if they can build on 2018. Strahm, Espinoza and Lamet will be coming back from different stages of injury. and then there is the rest with Perdomo, Nix, Kennedy, and Diaz. This isnt a rotation that is a TOR arm away from being able to contend. With the emphasis the front office has placed on prospects; the ones they chose to part with have to be the right ones and net out a long term solution that isn’t currently here. A Suarez/ Senzel deal would be a much better target. Three years of Thor, while nice just isnt enough for the pieces you have to give up. aces are rare. Star quality and a good brand will be there. Mejia is not a good fielder as catcher and doesn’t hit well enough to take up a spot as a corner OF. I don’t . With Tatis off the table I don’t think there is a high enough headline talent to get this done. Trade Myers (& a portion of his contract), Hedges, Quantrill and Baez. You’re an idiot. They wouldn’t do it for Hedges, Quantrill and Baez. Then Myers makes the package worse, not better. I agree, Mejia supposedly has tons of upside and we want to see how well he pans out. But If dealing him allows the team to hold onto Tatis, Gore, Urias, Petine and Paddock. Then adding Thor and having Hedges as our long term #8 hitter would be worth it. I would trade Mejia over Hedges if that would reduce what else is needed.